We’re on a quest to make space matter. On the outside, you may see a building. It’s a hospital, or a police department. A high-rise office building, or a world-class museum. A prestigious educational institution or an expansive warehouse. 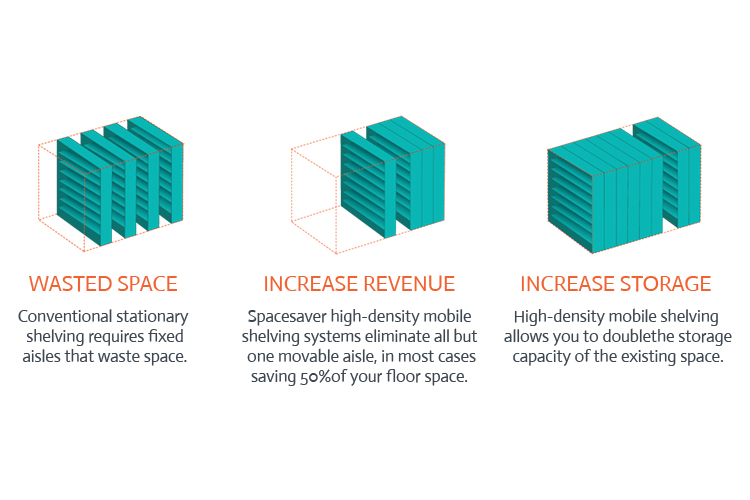 With smarter use of a building’s space, it can be a space to protect. Heal. Learn. Build. Advance. We listen to what customers want to accomplish with their space—and through the engineering and manufacturing of storage and shelving solution, we do our part to help them achieve it. As an innovator in storage, we’ve helped revolutionize the use of space for over 40 years—and with your help, we can continue to make sure the next 40 years are just as strong. Click the video to take a whirlwind tour of Spacesaver’s two plants, located side-by-side in Fort Atkinson, Wisconsin. We are problem solvers. We are solution providers. We reside in the world of storage everyday. We see the beauty in the intangible things—the organization, safety, security, and efficiency that the right storage solution can bring. Stick with us, and you’ll find that storage—and the space it creates—is anything but boring. Spacesaver Corporation began in a 10,000 square foot barn in 1972 in Fort Atkinson, Wisconsin. Our founder, Ted Batterman, had the foresight to know that three key issues would impact businesses in the future—lack of space, an increase in energy costs, and overall productivity. He wanted to create a solution that addressed these things, and starting with seven team members, he developed the concept of high-density mobile shelving. 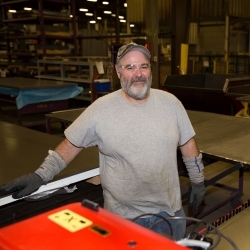 Today, Spacesaver’s production facility is 300,000 square feet—and we employ 374 full-time team members between our manufacturing and administrative divisions. The expertise and hard work of our people is evident in the products that we design and ship every day. We’ve developed and engineered a broad range of products since our beginnings in the barn, and all of them align with our focus of being able to create fully integrated storage solutions, whether you’re a police department, a military base, a gallery or museum, a healthcare facility, a warehouse environment, an office, or a library. There’s another number we’re especially proud of, and that’s the over 300,000 installations we’ve been a part of, all over the United States and abroad. That’s over a quarter of a million problems we’ve solved, solutions we’ve created. 300,000 ways we’ve made a person or an organization’s life simpler. And that’s part of our bigger picture. It’s always been about more than simply preserving or increasing storage space. It’s about giving people and businesses the tools they need to do their jobs in a way that makes them safer, more productive, more efficient. When you see those improvements in your business or organization—you can do great things. And giving people a better space to learn, space to protect, space to heal, space to grow—we like to know that we contribute to that—and that we can accomplish it from our small corner of the Midwest. Nurture change—encourage, lead, and drive it. We are an ever-evolving company, changing to stay ahead of our competition and keep them guessing. We define innovation in our industry and share that knowledge with our partners. At all levels, we embrace our innovative vision and strategy. Seek multiple perspectives. Collaboration and open, respectful communication are appreciated and essential to our success. Our success depends on the knowledge and expertise we each possess—and we strive to continue personal and professional growth through experience, learning, and development. Through ambitious goals, we constructively confront and solve problems, execute safely, and take responsibility for our process—to produce measurable results. The best way to predict the future is to invent it. Be creative and daring—defy routine to create new successes. Ask “why” often to challenge mediocrity. Counteract stress and routine with fun and passion—for your life, work, and future. Positive attitude and enthusiasm breed forward thinking and a healthy work environment. Simple. A workplace that feels like a community. From sponsoring community events in Fort Atkinson to donating regularly to non-profit organizations and others in need, we believe that helping others—especially in a small community we’re a part of—is something that’s an essential part of Spacesaver’s foundation. In addition to the outside community, we’ve heavily involved with and invested in another group of people—our own. From celebrations and team incentives when we’ve hit sales or safety goals to company picnics and holiday parties, we do everything we can to make sure that you feel appreciated on a daily basis. Spacesaver is committed to the development of team members’ abilities for current and potential job requirements, which can consist of everything from on-the-job training, seminars, special courses, membership in professional societies, and tuition reimbursement. Many special courses and workshops can be attended through Spacesaver University, our own professional development platform. We want our team members to be healthy and happy, which is why we contribute money into HSA/HRA accounts, and our dental plan is an 80/20 plan. We also have an on-site nurse for issues that arise at work, and offer Wellness Reimbursements on things like health club memberships, annual physicals, and dental cleanings. Every Day is Jeans Day! We match the first 8% of your 401K contributions 50 cents on the dollar. Profit sharing is a guaranteed 2% of annual compensation. And, there’s an incentive payout that everyone in the company gets if we reach our yearly sales and operations goals. Loading/unloading components from overhead conveyor in the quantities and sequence required, following written production schedules, and packaging product as required. At the unload area we see the parts after they have already been painted. We are the last people to touch the parts before they are shipped to our customers, so it’s very important that we check for quality defects when unloading parts. At the start of our day, we check our dispatch so we will know what is going to be coming off the paint line, and we make sure we have the right size pallets available for packing the parts by customer order. When the parts come down the paint line, we take them off of the line and use a bander to tie the pieces together in a pack. The people at the end of the line make sure the right number of parts goes to the right customer order. What do you like best—about your job and Spacesaver? Working on the paint line is very fast-paced, so there’s no time to be bored—and there’s plenty of variety. I enjoy the people that I work with—everyone tries to help each other out and work as a team. There’s also extra motivation to perform well—the management team notices things like that. Perform processes to complete mechanical and electrical assemblies and sub-assemblies; using hand tools, electronic, and pneumatic tooling. Interpret shop orders and prints to assemble products to specifications. We typically start our day by checking the computer system (IFS) for what orders we will be producing during the day. We also use this program throughout the day to report progress and bundle what we have completed. We use hand tools and overhead air tools to add components to our carriage system for our high-density mobile storage products—adding things like wheels, shafts, motors, and non-powered brakes. The carriage is what makes our system mobile. There is a lot of variety in what we do, because there are many different configurations of how a carriage can be built. I also have a lot of satisfaction in knowing what the finished product will be used to store—everything from dinosaur bones to torpedoes to medical equipment. And, Spacesaver is a place you can retire from—they offer profit sharing, bonuses, and even a 401K match. Set up and operate assigned equipment for daily production of product, using shop orders and prints. Produce parts that meet customer’s quality and delivery requirements, and troubleshoot equipment problems. In my daily work, I run a turret—a piece of machinery that punches holes in sheet steel before it is sent to a press brake to have the bends put into place. Running a turret consists of loading and unloading sheet steel to the turret, selecting the correct program for the part we want to make, and making quality checks. I really enjoy looking at my dispatch for the day and managing my time so I complete the day’s work. Also, this place is full of opportunities. When I first started, I couldn’t even read a tape measure, and now I’m operating a sophisticated piece of equipment! Responsible for providing the communication between Spacesaver Corporation and the sales personnel in our distribution network regarding sales opportunities, as well as providing timely technical sales support, project strategy, competitive intelligence, pricing, and other information as needed to assist our distribution partners in closing business. I work primarily with our international distribution salespeople in Canada, Mexico, Australia, and the United Arab Emirates. I’m their resource at Spacesaver for product questions, product applications, and requests for custom or ETO (what we call Engineered-to-Order) products. I also gather information on competitive projects to ensure Spacesaver has strategically put their best foot forward when it comes to price. Our department strives to drive revenue and keep the manufacturing plant busy with orders! I enjoy the fast-paced environment and working on many different things throughout the day. Not once does it seem methodical or slow. Occasionally we travel to meet with customers and having face-to-face contact with them is always the best kind. Most importantly, it’s always great to see a project you’ve worked on become an order. It’s a friendly atmosphere here, and your fellow team members are always willing to help. Responsible for leading the execution and coordination of creating compelling content through various mediums that generates awareness and shortens the sales cycle. This role works collaboratively with the entire marketing team to conceptualize and develop effective marketing content that supports the overall strategy and campaigns. The Content Marketing Specialist also works closely with our distribution/sales, customers, and external resources. First thing in the morning I check email and schedule social media posts for Spacesaver and some of our distribution partners. I spend the majority of my day writing and editing web content—either for Spacesaver’s website or for some of the area contractors websites we’re currently redesigning as part of a special initiative. In between, I also work with other members of the Marketing Team on selecting and writing copy for print/digital advertising, pay-per-click advertising, email marketing campaigns, case studies, and other writing tasks that come up. I really enjoy the flexibility my job provides. When I need some extra inspiration or there’s bad weather, I can work from home or a coffee shop as long as I’m still getting my work done. I also work hard to find fresh and creative ways to talk about our storage solutions and how we solve challenges for our customers. It keeps me on my toes as a writer to always be finding those new perspectives. The people on my team really make me look forward to coming in. Everyone is smart, creative, and pretty funny—there’s always someone to talk through ideas with, and together, we’re working to make our marketing strategy extremely progressive—something you can’t always find in a traditional B2B manufacturing setting. Responsible for the mechanical design and documentation of new products and product line extensions from concept through commercialization. The position reports to the Director of Engineering and works closely with Product Managers, Project Managers, and Designers. My daily work can be different from day-to-day depending on the workload. I can do everything from new design work using 3D CAD (PRO-E/CREO) to answering manufacturing and sales questions to data entry by structuring bills of material. There are also times you get to help build prototypes, making changes to your design while you build. The Product Engineer is responsible for all design aspects of developing, improving, and supporting assigned Spacesaver product lines. Primary responsibilities include supporting quality improvements, providing new product designs, and supporting engineering aspects of existing product lines. My work can vary significantly depending on the type of project I’m involved in. Often I am on a product development team, working toward the release of a new product. My daily duties include planning and developing product configurations in our ERP system (IFS). This involves rules definition for the sizes and features that are available on a specific product line. Implementing the configuration calls for the creation of tables, formulas, and conditional logic to define the product, resulting in configured structures, routings, and work guidelines. In addition, I plan and develop product configurators that automate the creation of CAD (Creo/ProE) data for configurable products. These CAD automation configurators are developed using KBMax software. The process involves linking product data outputs from our ERP system to features and driving dimensions in the appropriate CAD models. To accomplish this, VB programming is used to develop formulas and define conditional logic—the result being CAD data that can be used by Operations to machine the configurable parts. I really enjoy working with my fellow engineers and designers to develop solutions to challenging or complex issues—not only engineers, but with a variety of people from different areas of the company. We have a great group of people here. The Production Supervisor is responsible for the operational performance of the production area assigned, which includes but is not limited to: safety incident rate, cost of quality as a percentage of sales, quality no-charge expedited order percentage, on-time delivery percentage, labor as a percentage of sales and value added per labor hour, all of which are inputs to the budgeted operating profit percentage. Financial responsibilities include operating expenses as a percentage of sales and operating profit as a percentage of sales. I start my day reviewing each schedule for each area of my responsibility, in order to assign proper staffing to each area. Once that’s complete, I review other areas in the plant to see if they may require any resources I may have available. The rest of my day revolves around working on team member and process development. This is done in many different ways—working with team members and my peers in developing improvements to help with improving efficiency and team member skill sets. The goal is to not only improve the rate of how we produce our products, but also to improve quality and team member development. I’m given quite a bit of independence in managing my areas of responsibility. I feel like we have a great support system when needed to resolve any issue, from sales to manufacturing. I also really appreciate the diversity of our product line, and how the company is open to change and improvement. Even in the short amount of time I’ve been here, I’ve seen Spacesaver take on major projects to improve itself—and that to me is the key to future success. Small towns aren’t always small places. Set against the beautiful backdrop of Lake Koshkonong and the Rock and Bark Rivers in southeast Wisconsin, Fort Atkinson is just the right mix of big city amenities and small-town convenience. With a full calendar of events, clean and safe parks and outdoor areas, and close collaboration between business, healthcare, education, and city services, Fort is a great place to live or work—or both. 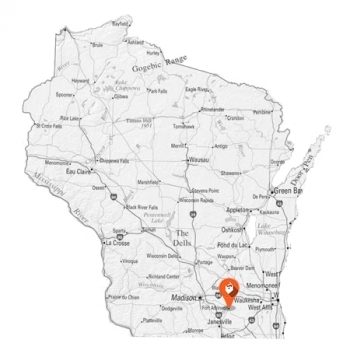 The Fort Atkinson Chamber of Commerce is a great place to begin when looking into additional information on relocation or visiting. Check out their website here.